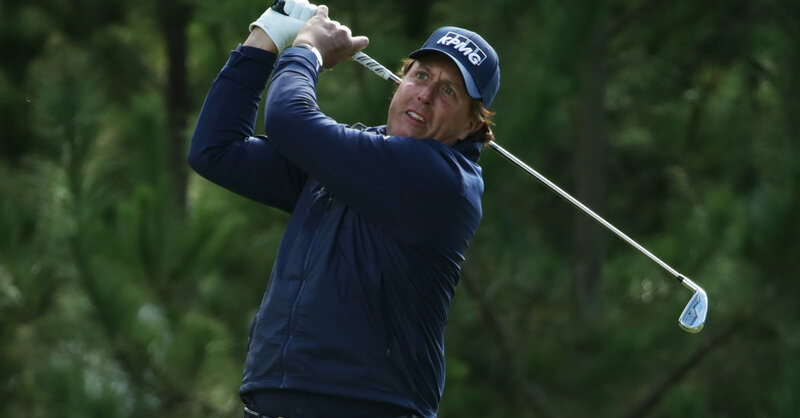 PEBBLE BEACH, Calif. — Phil Mickelson has been coming to the Pebble Beach Pro-Am since 1995 and has won it four times, so there is not much he has not accomplished along the Monterey Peninsula. Until Thursday, when Mickelson delivered something new: He did not miss a single fairway. His accuracy was better than his memory. According to the PGA Tour, Mickelson has done it seven times, most recently 21 years ago at Torrey Pines. Perhaps more remarkable about that round in 1998 was that even playing from the short grass on every shot, he still had a 73. That was not the case this time on an ideal day — perhaps the last beautiful day of the week — for scoring. Over three rain-softened tracks — the Shore Course at Monterey Peninsula, Spyglass Hill and Pebble Beach — 59 players in the 156-man field shot in the 60s. Brandt Snedeker was probably not thinking birdie when his tee shot on the par-5 18th at Pebble Beach missed left and bounced down to the sandy shore. He played it off the beach back to the fairway, hit a 7-iron to 10 feet and made the putt for a 69. And there was plenty of good golf along the way. Gay finished his front nine at Monterey Peninsula with five straight birdies. Langley, who shared low amateur honors in 2010 at Pebble Beach in the United States Open, made seven birdies in a 10-hole stretch in the middle of his round at Monterey Peninsula. He finished with a birdie to pull even with Gay. Cody Gribble had a 6-under 66 at Spyglass Hill, and Si Woo Kim had a 6-under 66 at Pebble Beach. Dustin Johnson, not so fresh after his victory Sunday halfway around the world at the Saudi International, did not look the worse for wear. He had a 5-under 66 at Monterey Peninsula despite a few wobbly moments late when he bladed a bunker shot on the 15th hole for his only bogey and drove into bushes and had to take a penalty drop on the par-5 16th, where he managed to save par. He played in his usual group with the hockey great Wayne Gretzky, Jordan Spieth and the country singer Jake Owen. Spieth chipped in for birdie and made plenty others to join Johnson at 66. It was not easy for everyone. The defending champion, Ted Potter Jr., made two birdies on his opening nine holes at Spyglass and still shot 42. The next nine were not much better, and his 82 matched his high score on the tour. Johnson does not get worked up over much, weather included. Looking left at the sun over the ocean, he said, “I’d like to have this weather the rest of the week.” Told there was little chance, Johnson shrugged.